Journalist Linda Moulton Howe has written an excellent story which I believe supports Crop Circles Research Foundation’s position that it is possible for us to communicate with ET civilizations and clearly demonstrates that this event has, in fact, already happened! 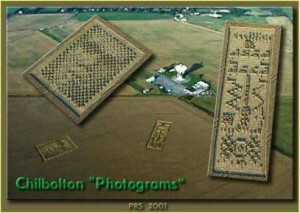 I invite you to visit Linda’s website Earthfiles (http://www.earthfiles.com/news.php?ID=2039&category=Real+X-Files) and carefully read her story titled December 7, 2012: Astronomer Carl Sagan’s Letter to U.K.’s MoD About Crop Circles. If you cannot suscribe to Linda’s EarthfilesReal X-Files, then Paul Vigay’s analysis of the relationships between the Arecibo message and the Chilbolton reply can be found here at http://home.cropcircleresearch.com/articles/arecibo.html. The Crop Circle which occurred in wheat crop at Chilbolton, reported on August 19, 2001 was perhaps the most important Genuine Crop Circle which has ever been discovered. The Chilbolton Crop Circle clearly demonstrates that the Sagan / Drake message from humanity which was transmitted into space from the Arecibo radiotelescope in 1974 was intercepted by an ET civilization which then sent to us their reply via the Chilbolton Crop Circle in 2001 – 27 years later! This occurred despite the fact that it should have required 25,000 years for the Arecibo message to reach the star system at which it was aimed! Clearly, someone “out there” intercepted the message and replied, and the means employed to present this message of reply to us can only be descibed as nothing less than miraculous. People talk all the time about miracles which may or may not have occurred over 2000 years ago as reported in The Bible, but when miracles are occurring in the Crop Circles every summer very few are paying attention. How does that work? Well, it works out badly, as we are gradually finding out. The August 2001 ET reply to the Sagan / Drake Arecibo message. Sagan’s letter to the MoD, dated March 6, 1996 suggests that Sagan had by then become aware of deceptive practices carried out by the U.K.’s Ministry of Defense which were intended to discredit the Genuine Crop Circle Phemomenon. If we think about it, this was the only way for those interested parties, namely the British and U.S. governments/militaries, who have been successfully covering up the UFO Phenomenon, to sustain their ongoing and long-standing deception regarding the reality of UFOs and ET visitation to this planet. If they had done nothing to squelch people’s growing interest in the Crop Circles by making it appear as though the Crop Circles were all hoaxes of human origin, soon people would be putting 2 and 2 together and would have been asking questions about a possible relationship between Crop Circles and UFOs. The Crop Circles would have become more and more difficult to dissociate from the UFO Phenomenon. The powers that be did what they knew they had to do to – they had to find a way to discredit the Crop Circles, just as they had been doing all along about UFOs. Sagan apparently got wind of this and, to his credit, he brought his awareness of these deceptive actions to the attention of the British MoD. I do not know if Sagan received any reply from the MoD. Perhaps by 1996 Carl Sagan had realized that, years before, he had been mistaken in the testimony he presented to the U.S. Congress regarding his opinions about the importance of the UFO Phenomenon during the 1968 Congressional UFO hearings in which he was invited to participate. These Congressional UFO hearings occurred just prior to the publication of the University of Colorado’s UFO study (“The Condon Report”) in 1969. Perhaps Sagan realized that he should have been much more supportive of the idea that UFOs were worth looking into, the position which was held and promulgated by the 5 other preimminent scientists who also testified at those same hearings. In my opinion, this was the most significant error which Sagan made in his assessment of the UFO Phenomenon and one that stands as a black mark on his otherwise “stellar” performance as a man of science. I encourage everyone to read Sagan’s letter to the British MoD which Linda has published in her Earthfiles Real X-Files, and to study Linda’s detailed account of the correlations between the Sagan / Drake Arecibo message and the message which was discovered in the Chilbolton Crop Circle. This is an amazing event which will one day be in our history books – if the human race can survive our government’s apparent compulsive predilection for obfuscating the TRUTH. UFO Disclosure?? How many times have folks said, it’s going to happen and we are still waiting. To me, UFO Disclosure is like a person in a relationship who has been cheating for a long time, finally says, “Honey, I got something to tell you. I have been unfaithful for some time now and the reason I didn’t tell you before now, because I was protecting you. I knew you couldn’t handle the truth.” Yeah, okay, and any person who stays with the person who cheated has a great ability to forgive and move on, but I doubt if trust would be iron clad from then on. Governments need their people to trust them and believe they are there for their good, ha, and when the veil is lifted there will certainly be anarchy. So they are protecting themselves, not the masses. Please see the next post, published today, on this website. It appears that the veil is being lifted, and now we have very strong evidence that this is indeed the case. Let us not go down the path of anarchy. That path is going to be too messy, too painful, and will only further delay our getting down to the work that needs to be done. Instead, let us try to get to know the ET races who are visiting here and find out what we might learn from them that will hopefully enhance our ability to save the biosphere of this wonderful planet Earth that is our only home. Those who have managed, or “handled” this information for so long are going to be observing our reactions to this news with keen interest. Let us demonstrate through our words and through our actions that we CAN handle the truth, and that we can take this new reality and run with it in a positive direction. Let us show them that we are ready to face the future, knowing that we are not alone. Diddly – well put – “they would rather live the lie knowing full and well that it IS a lie”. This is off the topic of crop circles, but shows your idea to be true: Oil executives who simply cannot let themselves believe that CO2 emissions are causing global warming. I know an oil CEO personally, he is highly intelligent and not prone to blindness or fantasy. However, he CANNOT admit the climate changes we see clearly now because global warming is a tragedy that means all his wealth and power and respect are “ill-gotten gains”. He instead likes to tell us how he “delivers the energy that allows us to prosper”, which is true for about 100 years, and then 1000 of suffering due to his great mistake. And, I suppose religion is another example… no matter how the fossil records read, or isotope clocks showing the timeline, or the scientific explanations for things that only “god” could explain before, they prefer their willful blindness. And so with UFO and ET, the insecure and small minded amongst us “chooses not to believe”. They need to have faith in our government too, never mind the obvious criminality and lying our government displays. For some time oil for energy has been a necessary and in fact indispensable factor in facilitating the social and technological evolution of human civilization. Any gains enjoyed by those who have profited from that business were not, in my opinion, ill-gotten, but now it is past time to close that chapter of humanity’s development. Oil for energy is now clearly a defunct concept. Human civilization must move on to a new energy paradigm, but the inertia of habit and the greed of those who continue to profit from our present environmentally destructive “petroleum for energy” model stand in the way of investigating many new avenues which show promise as the energy source(s) of our civilization’s future. The UFO is one of those avenues, but the “Truth Embargo” that surrounds the UFO has rendered it as taboo and unapproachable by mainstream science. This is an unfortunate situation which we are trying to correct and we will correct as more and more people begin to realize that we have been deliberately misled away from the Truth about the UFO and Extraterrestrial observation / visitation of this planet. As you will note from Potter’s statements, the energy output from a UFO is tremendous, and this model of energy production will be a keystone in our civilization’s near future energy paradigm. I would suggest that your friend’s occupation as an oil company CEO is presently facing a soon expiring shelf-life, and that his company should re-direct their multi-billion dollar quarterly profits toward research and development of the energy systems of the UFO. He might consider contacting Paul Potter as a potential member of such an R&D team, as Potter clearly has a head start in understanding how such systems produce the energy they require. As for the “evolution vs. creation” debate, I do not think we need to allow ourselves to be directed into one box or the other. Why could what we observe around us not be the product of both? While I do not argue the FACT that evolution plays a very significant role in the fine-tuning of species within their various ecological niches, I also find that creationists do present some persuasive examples which argue against evolution being the sole explanation for what we encounter in this reality. In my opinion, I think that both evolution and “creationism” (perhaps better termed, as Sheldrake has termed it, the “implicit order”) are factors which work in concert to produce the complexity and the majesty of the Universe we observe. All I can say about all religions is that, like oil for energy, religions are defunct belief systems which have become a millstone around the collective neck of humanity and could potentially provide the path toward our own self-annihilation in a world armed with nuclear weapons. The simplistic concepts that encompass religion were appropriate for human beings whose most advanced technologies were wheels and fire. But today, religions are polarizing and divisive, and they cannot and will not provide the much deeper understanding and appreciation of this Universe which will be required of our civilization that we may one day leave this planet and become a part of the wider galactic community. Members of that community are presently here, observing all of this unfold. We would do well to jettison religion as a relic of the past that, like oil for energy, may have been a necessary element in our social evolution, but has now become a toxic threat to the continued progress of humanity. WE HAVE BEEN GOING THROUGH SOME OF THE PREVIOUS POSTED EXCHANGES ON YOUR SUPERB WEBSITE AND AGREE WITH A MAJORITY OF WHAT IS POSTED. THE AMAZING DOCUMENTED ET RESPONSE TO THE ARICEBO RADIO DIGITAL MESSAGE WILL BE IGNORED AND DENIED BY THOSE WHO PREFER TO WALLOW IN DARKNESS INSTEAD OF ALLOWING THE LIGHT OF TRUTH TO SHINE. YOU ARE CORRECT IN REFERRING TO THIS REPLY EVENT AS A FORM OF “MIRACLE” BECAUSE THERE IS CONSIDERABLE EVIDENCE EVERYWHERE THERE ARE ADVANCED, INTELLIGENT AND BENEVOLENT LIFE FORMS WHO CARE FOR THE EARTH OTHER THAN HUMANS. WHETHER WE CHOOSE TO CALL THEM ET, STAR VISITORS, ANGELS, OR ALIENS IS IRRELEVANT BECAUSE THERE IS ORDER TO THE UNIVERSE AND SOLAR SYSTEM OF INTELLIGENT DESIGN. THOSE WHO DENY THE EXISTENCE OF THE CREATION OF THE SOLAR SYSTEM AND EARTH FOR OUR USE AND BENEFIT, BY THE PREPOSTEROUS ACCIDENT OF “BIG BANG” OR “BLACK HOLE’ ORIGIN ARE AS BLIND AS THE WARNINGS FOUND IN THE BIBLE ITSELF. WE HAVE FOUND THE SCRIPTURES A SOURCE OF HISTORY AND KNOWLEDGE THAT ARCHEOLOGY SUPPORTS ASIDE FROM ANYTHING TO DO WITH “RELIGION”. THE FACTS WRITTEN DOWN OVER THE TIME PERIODS COVERED HAVE PROVEN BENEFICIAL IN EDUCATIONAL TERMS, BUT HAVE BEEN ABSORBED, TWISTED AND MORPHED INTO THE VARIOUS “RELIGIONS” OF TODAY, MANY OF WHICH ARE EITHER AT WAR WITH EACH OTHER, OR WITHIN THEMSELVES, AS IS PROVING TO BE THE CASE WITH THE MORE RECENT FACTUALIZATION OF ISLAM. THE TRUTH IS THAT NOT ONE SCIENTIST OF ANY KIND HAS BEEN ABLE TO PROVE ANY OF THE FACTS RECORDED IN THE SCRIPTURES WRONG OR FALSE. ALL THEY HAVE BEEN ABLE TO DO IS INVENT OTHER IDEAS AND THEORIES SUCH AS MODERN DAY “EVOLUTION”. DNA SCIENCE HAS NOW CONFIRMED HUMANS ARE NOT PRIMATES AND ARE NOT CONNECTED AND SHARE MORE DNA WITH ET THAN WITH ANY EARTH BOUND ANIMALS, SO THIS FOOLISH IDEA MODERN HUMANITY “EVOLVED” FROM PRIMATES IS CARTOONISH AS SATURDAY MORNING PROGRAMMING. WE ARE HAPPY TO SEE THE SUPPORT AND IMPORTANCE YOU AND MANY OTHER SUCH AS DR. LINDA MOULTON HOWE HAVE EXTENDED TO THE CHILBOLTON ET REPLY CROP CIRCLE MESSAGE OF CONTACT BY THAT CIVILIZATION OF ET’S. ET, STAR VISITORS, ANGELS OR ALIENS ARE DIRECTLY INVOLVED WITH HUMANKIND AND THE EARTH, WHILE ANYONE WHO DENIES THIS IS WELCOME TO FOLLOW THE PATH OF DARKNESS. PEOPLE CHOOSE TO WALLOW IN DENIAL AND AS IS MENTIONED ABOVE, EVEN ET LANDING IN WASH D.C. WILL STILL NOT CONVINCE THEM ALL SIR..
BECAUSE MANY ASPECTS OF THE ET PHENOMENON REMAIN UNKNOWN OR POSSIBLY STILL OUTSIDE OF OUR COLLECTIVE SCIENTIFIC UNDERSTANDING, THERE IS ONE SCRIPTURE THAT DOES CONFIRM THE LIGHT WILL CONTINUE TO BRIGHTEN AS KNOWLEDGE OF EARTH AND ITS PURPOSES IS REVEALED. FORTUNATELY SOME OF US ARE ALIVE DURING THIS PERIOD OF ENLIGHTENMENT AND RECOGNIZE THE AMAZING CROP CIRCLES ARE ONE OF THE FORMS OF LIGHT AND KNOWLEDGE BEING SHARED WITH US OR SENT AS ADVICE AND WARNINGS. THERE HAS BEEN ABSOLUTELY NO HARM FROM ANY CROP CIRCLES AND WE CAN NOT SAY THIS FOR OUR MILITARIES AND GOVERNMENTS WHO ARE SUPPOSED TO BE OUR “PROTECTORS”. WHEN WE ARE ABLE TO PROPERLY UNDERSTAND THE GEOMETRIC LANGUAGE BEING USED BY THE CROP CIRCLE CREATORS, MAYBE WE WILL BE ABLE TO DETERMINE IF THEY ARE ANGELS OR WHICH ET IS MAKING THE BEAUTIFUL DESIGNS AND BRILLIANT MESSAGES CONTAINED WITHIN THEM. WE AGREE WITH YOUR ASSESSMENT THAT THE CHILBOLTON CROP CIRCLE WITHOUT DOUBT MAY BE THE MOST IMPORTANT CROP CIRCLE TO THIS POINT IN TIME BECAUSE IT IS A REPLY MESSAGE. IT’S AMAZING THAT IT WAS INTERCEPTED AND RETURNED IN SUCH A SHORT TIME FRAME, WHICH MAY INDICATE THAT PARTICULAR ET GROUP MAY BE FAR CLOSER THAN WE REALIZE LOOKING FOR EARTH AS WELL….ON VOYAGE FROM THEIR HOME PLANET MUCH FARTHER DISTANT. WE WERE SORRY TO READ THE PART OF THE RETURN MESSAGE TRANSLATION THAT STATED “CONDUIT CLOSING”, HOWEVER REMAIN HOPEFUL THIS ET GROUP WILL REPLY AGAIN OR CREATE ANOTHER DECIPHERABLE MESSAGE VERY SOON. UNFORTUNATELY THERE ARE PEOPLE AROUND PLANET EARTH WHO DO NOT SHARE IN THE COMMON GOAL TO CREATE COOPERATION WITH OUR ET VISITORS WHO OCCUPY OFFICES OF GOVERNMENT, HOWEVER THERE IS GROWING AWARENESS AMONG THOSE WHO LOOK FORWARD TO THE CHANCE TO COOPERATE WITH ET.